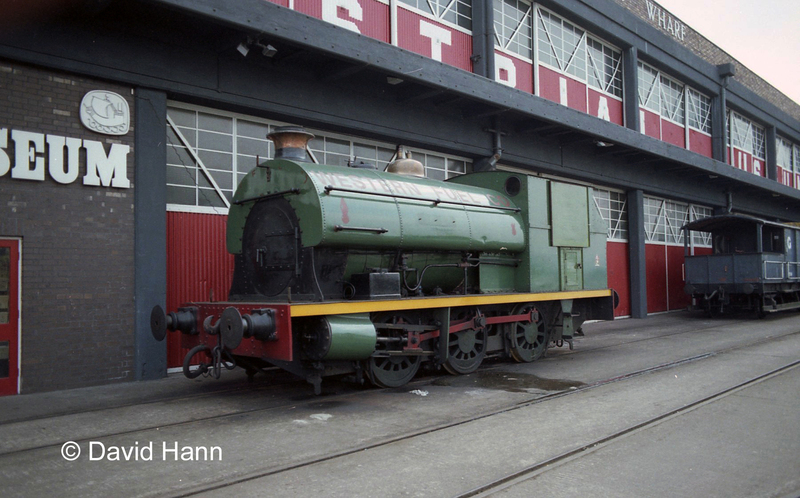 This locomotive was acquired in 1964 for the Bristol City Museum Technology collection after working continuously for twenty-seven years as a shunting engine at the Port of Bristol Authority’s docks at Avonmouth. Bristol Corporation has, therefore, owned the engine since it was built in 1937, as both the Port of Bristol Authority and the Bristol Industrial Museum, where the engine is now based, are managed and financed by the same local authority. Locomotive engineering in Bristol was established in 1837 and remained an important local industry until the 1950s. Thomas Peckett set up the new Atlas Locomotive Works at Whitehall Road in the St. George area of Bristol in 1881, incorporating the earlier business of Fox­ Walker & Company (1863-1881). 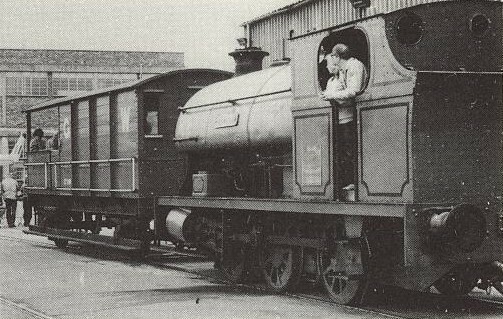 Peckett’s built some locomotives for export but specialised in the construction of industrial saddle-tank locomotives, of which Henbury is an excellent example. The company took pride in the accuracy of its design and production methods, which were based on templates and special gauges to ensure that basic components were interchangeable. Repairs and refits could, therefore, be carried out with the minimum of delay which was important for anyone operating industrial locomotives. 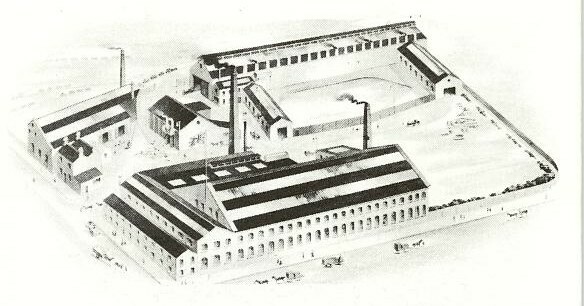 An illustration of the Atlas Locomotive Works, published in Peckett’s catalogue in the 1920s. The demand for new industrial steam locomotives fell after 1920 as operators began to use locomotives with petrol or diesel engines and main-line railway companies continued, traditionally, to build their own locomotives. Peckett’s remained in business until the early 1960s, even building a few diesel locomotives shortly before the Atlas Locomotive Works closed and brought locomotive construction in Bristol to an end. The Atlas Works later became the site of Strachan and Henshaw’s mechanical handling equipment division. 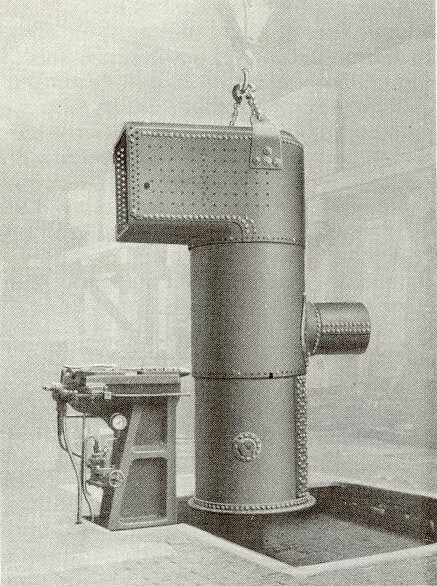 Peckett’s used this hydraulic riveter for the final assembly of boilers and fireboxes. Henbury joined a large fleet of steam locomotives at work in the main Port of Bristol Authority docks at Avonmouth in 1937. For over seventy ­five years, from when these docks opened in 1877, the railways were the essential means of transporting both goods and passengers through the port. Every warehouse was designed specifically for railway, not road, transport. The Port Authority always had over twenty steam locomotives and many hundreds of its own wagons in daily use in addition to all those supplied by the main-line railway companies. Several port engines were fitted with vacuum ­brake equipment so that they could work boat­ trains into the passenger terminals at east, and later south, piers. Numbered S9, Henbury was unusual in having the cab and front of the saddletank lined out, where her stablemates wore unlined green livery. With the declining use of railways for moving freight after the Second World War, the Port of Bristol Authority first replaced its steam locomotive fleet by diesel engines in the early 1960s. These remained in use until the port’s railway system was closed in 1983; rail-freight to the port would be handled by British Railways while the majority of internal freight movement within the port was done by road vehicles. The port’s fleet of ‘common-user’ railway trucks was scrapped in 1981. Nine of these trucks and vans were preserved by the Bristol Industrial Museum and many more were saved by other railway museums and preservation groups throughout the country. Henbury appears to have been a popular engine with the port’s locomotive crews, having a reputation for ‘free steaming’. She was, therefore, one of the engines kept in good working order until the diesel locomotives took over in the early 1960s. Parts from other port engines were ‘cannibalised’ to keep engines like Henbury running. Fortunately for the museum, Henbury was fitted in 1960 with a five-year-old boiler, then being used on another engine (Mackenzie) of the same class. This boiler has been described as one of the best in the country to be found on a preserved steam locomotive. In 1962, Henbury, by then designated port locomotive S9, was given a final major overhaul so that she was still in reasonably good mechanical condition when withdrawn from service in 1964. During the 1960s, plans were drawn up for a new museum and art gallery building in Wine Street in Bristol. 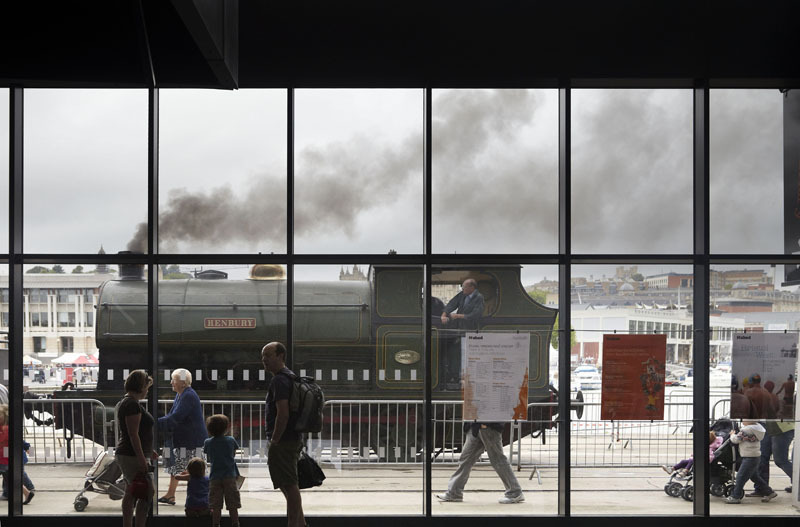 This was to have included space for a range of local industrial exhibits, so arrangements were made by the Bristol City Museum to acquire one example of a locomotive by each of the locomotive builders in Bristol: Fox-Walker & Company, the Avonside Engine Company and Thomas Peckett & Sons. Two port steam engines, Henbury and an Avonside 0-6-0, Portbury, were, therefore, put into store at Avonmouth in 1964 pending restoration and display by the museum. Plans for the new museum and art gallery complex were abandoned in the early 1970s and the problem of housing and restoring these engines had then to be resolved. Henbury was moved in 1972 to Radstock for restoration by the Somerset and Dorset Railway Museum Trust. She was fitted with a steam ejector to work train vacuum brakes and was in steam successfully, there, in 1972 and 1973, giving brake-van rides. The trust had to transfer its operation in the mid-1970s to Washford Station in Somerset and Henbury was not used for several years. 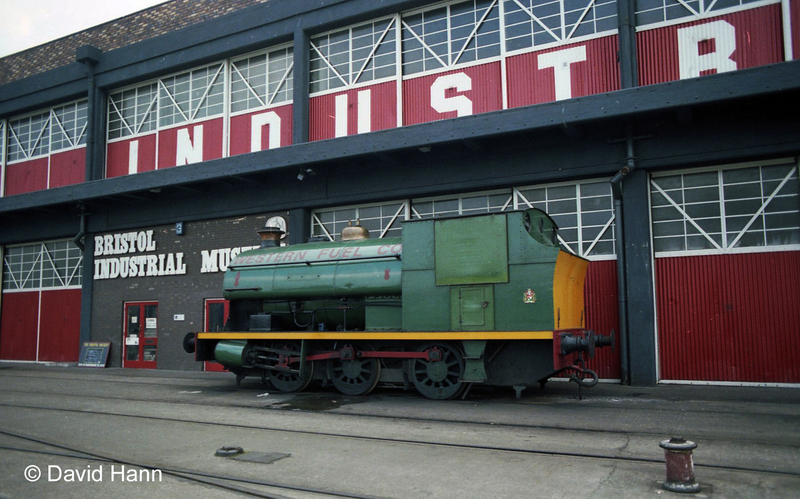 However, she was subsequently rebuilt to full working order in February 1978 and used to perform the opening ceremony of the Bristol Industrial Museum on 17 March 1978. Maintained by a small, but active band of enthusiasts, Henbury has remained a popular attraction for the Industrial Museum, and latterly as one of M Shed’s working exhibits. 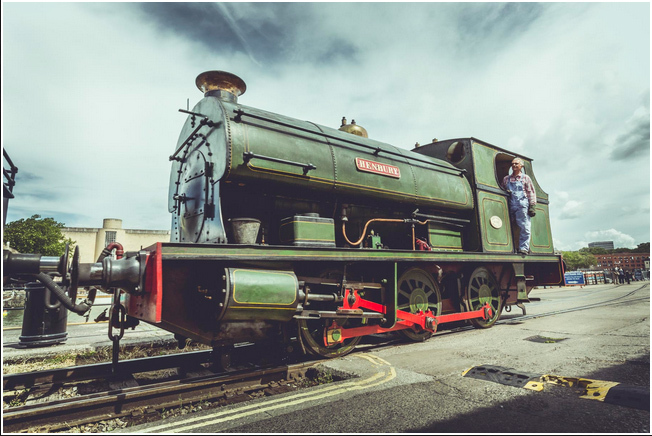 Henbury was returned by rail to her original home, the Port of Bristol Authority locomotive shed at Avonmouth Docks, in 1980, to undergo a further major overhaul organised by Mr D. A. Martin of the Bristol Magpies Henbury Locomotive Group. The wheels were re-turned by the Severn Valley Railway Company at Bridgnorth. By March 1981 many other important jobs had been done including the overhaul of the valve motion, main bearings, connecting rod bearings, renewal of pipe-work, re-lagging the boiler and general re-painting. The engine was painted green with yellow and black lining, very similar to the standard livery once used by the Port of Bristol for its steam locomotive fleet. The boiler was examined and tested both by British Engine Insurance Company and British Railways’ inspectors, before the engine returned by road to the Industrial Museum to resume giving brake van rides in April 1981. The Industrial Museum site is adjacent to a large coal depot on Wapping Wharf, first established in 1872 and presently operated by the leading solid-fuel distributors in the south and south­west of England, the Western Fuel Company. The depot receives daily deliveries of up to one thousand tons of coal, mainly from the South­ Wales coalfields, which travels to the site via the Severn Tunnel, Ashton Junction and the former Bristol Harbour railway line which crosses the New Cut over Ashton Swing Bridge-opened in 1906. Western Fuels have been using their own diesel locomotive for a number of years to work the coal trains between Ashton Exchange Sidings and their Wapping depot. The Company’s Hudswell-Clarke diesel engine was scheduled for a major overhaul in September 1981 and Henbury was hired from Bristol City Council’s Arts and Leisure Committee as a replacement engine. When Henbury steamed onto Western Fuels site at 7.00 a.m. on Monday, 28 September to start her first shift as a working freight engine again she made railway history as the first privately ­preserved steam locomotive to work a scheduled commercial freight operation on British Railways. She worked for three weeks hauling coal trains of 450 tons gross-weight. Henbury has been a stalwart loco of the M Shed working exhibit fleet, operating throughout the metamorphosis of Bristol Industrial Museum into M Shed, and doing so single handedly during ‘Portbury’s latest overhaul. She has been withdrawn as of July 2014 due to the expiry of her 10 year boiler ticket, and is now undergoing overhaul in L Shed. I will never forget this now famous engines. My partner Alan Godfry and I bought 5 of these engines and have them transported by road to Albrighton and Wilson staff Phosphorus factory where I broke them up for scrap. I will never forget working on a firebox on the day of the Aberfan disaster. Hello Jim, thank you for the comment. Do you happen to remember which 5 locos you purchased? Many thanks.